Here are the steps for building this awesome appliance! SexiLog is built on top of Debian operating system thanks to the netinst media. The only customisation done during the OS installation (beside all the network/disk layout brew) was to check SSH server and Standard system utilities during tasksel step. Uptade /etc/fstab with the partition UUID and “path.data” in /etc/elasticsearch/elasticsearch.yml. Kibana is Elasticsearch’s data visualization engine, allowing you to natively interact with all your data in Elasticsearch via custom dashboards. Limit the number of shards used by elasticsearch to 1. “Disable” the distributed features by setting the number of replicas for shards to 0. ElasticSearch performs poorly when JVM starts swapping, we should ensure that it never swaps by locking the memory. 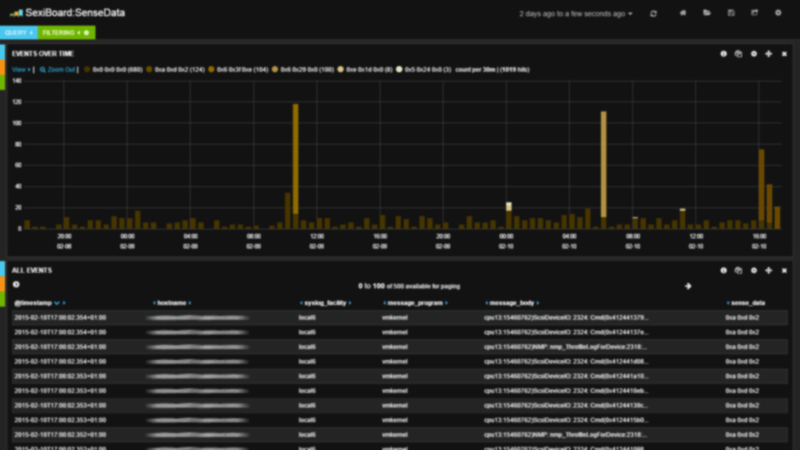 Yes, we customized cluster name, and of course it’s sexilog ^^. In order to be able to listen on port <1024 (typically syslog with UDP/514) user running logstash service must be root. Increase default heap size for logstash. Once everything is in place, reboot and enjoy your SexiLog appliance. Have fun! Those tweaks were done on SexiLog appliance, and you could do it on your side if you need it.